So as you might be aware, vSphere 6.5 just went GA. There is quite a bit of new stuff in this release and there have certainly been quite a few blogs concerning the flagship features. I want to take some time to dive into some new core storage features that might be somewhat less heralded. Let’s start with my favorite topic. UNMAP. Automatic UNMAP. This is the big one. This is something that was once in existence back in ESXi 5.0, but was withdrawn for a variety of reasons. It is finally back! Yay! When you click the “Edit” button, you can turn UNMAP on or off. The default is on. Now there is a bit of confusion with the settings here. The almost GA version I have still allows you to set UNMAP to low, medium, and high. My sources at VMware tell me that only low is currently implemented in the kernel, so changing this to anything but none or low will not affect anything at this time. So keep an eye on this. I need to officially confirm this. Now the important thing to note is that this UNMAP is asynchronous UNMAP. Meaning space is not reclaimed as soon as you kick off the delete. 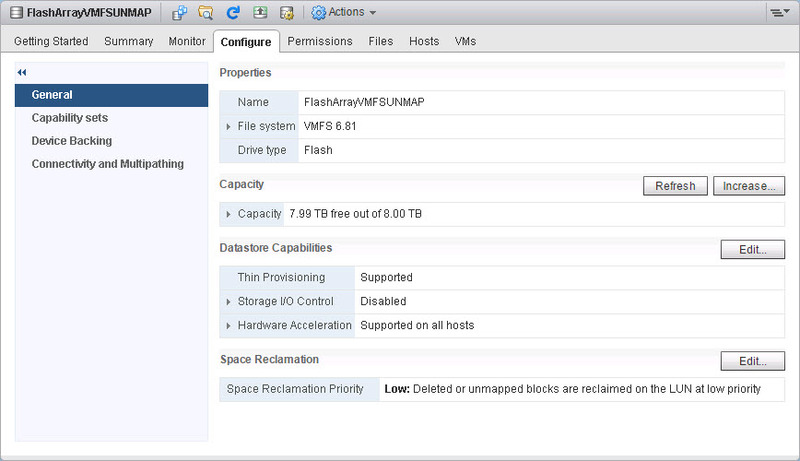 If you want immediate results, your handy esxcli storage vmfs unmap command will do the trick. Instead they have introduced a crawler, that runs on each ESXi hosts that on certain intervals will run reclamation on datastores to get space back. This is not immediate in any sense. Expect to see results within a day or so. The nice thing is that, dead space will be taken care of–you do not need to worry about it any more from a VMFS perspective. So how can I tell if it is working? Well since it could happen at any time, this is a bit tougher. Of course, watching your array is an option. Is space going down? If yes, it is likely to be working. The bold portions will say if anything has been issued to that VMFS. Vsish is not technically supported by VMware, so I am looking for a better option here. In vSphere 6.0, the ability to reclaim in-guest dead space with native OS UNMAP was introduced. Due to SCSI versioning support, only Windows 2012 R2 was able to take advantage of this behavior. In vSphere 6.5, SPC-4 support was added enabling in-guest UNMAP with Linux-based virtual machines. So what are the requirements to get this to work? First, how do we know it is working? Well there are a couple of ways. Of course you can check the above requirements. But how about from the guest? Of course replace the device identifier (/dev/sdx). The property you will look at is “Unmap command supported (LBPU):”. Also provisioning type seems to be set to 2 when it is thin, but I haven’t done enough testing or investigation to confirm that is true in all cases. SCSI version 6 and SPC-4 compliancy! Sweeeet. Also product revision level 2–this is the first revision of the virtual disk level I have seen. In 6.5 it is now two. This has to do with the SCSI version increase. Okay. We have identified that we are supported. How does it work? Running sg_unmap. This allows you to run UNMAP on specific LBAs. So, the discard option is by far the best option. sg_unmap requires quite a bit of manual work and a decent know-how of logical block address placement. Fstrim, still runs into some alignment issues–I am still working on this. Let’s walk through the discard version. In the following scenario an EXT4 filesystem was created and mounted in an Ubuntu guest with the discard option. This virtual disk was thinly provisioned. Four files were added to the filesystem of about 13.5 GB in aggregate size. The thin virtual disk grew to 13.5 GB after the file placement. So one thing you might note is that it is not exactly 100% efficient. I’ve noticed that too. The thin virtual disk does not always quite shrink down to the exact size of the reduction. It gets close but not perfect. Stay tuned on this–I’ve made progress on some additional details surrounding this. This is just the start, a lot more 6.5 blogging coming up! Great article with examples and CLI! If this uses vSCSI, should this also work local disks (not in VSAN mode) ? Can ESXi 6.5 translate in-guest OS trim to RPC truncate (for NFS storage arrays) ? Thanks!! It should work with local disks as long as those have the proper trim/unmap support on them. Though, I cannot guarantee that as I do not have any local disk with the proper support to test it. But in theory the vSCSI layer doesnt treat them differently than SAN attached storage conceptually. I am not sure about the RPC truncate either (I don’t have any NFS)–though let me ask around! Hi. Is vCenter must have? Do we need vmware tools to be installed in guest OS? Do I need to enable EnableBlockDelete on VMFS6 with next command ? Cody thanks for your reply! Since I’m not native speaker, I want to ensure I have understood you correctly so I will re-phrase my question: do I need to enable UNMAP somehow for VMFS6 in vSphere 6.0/6.5 ? do we need to use thin vdisks on thin LUNs in order to be able to utilize UNMAP? No need for this command in 6.0/6.5? You are very welcome! VMFS 6 is only in vSphere 6.5 so it is not in 6.0. If you format a volume in vSphere 6.5 as VMFS-6 UNMAP is enabled by default–you do not need to do anything to enable it. 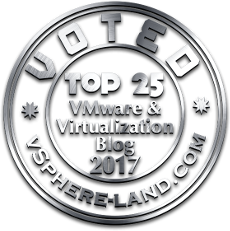 Pingback: Top 10 things you must read about vSphere 6.5 » Welcome to vSphere-land! I am a little confused with the automatic UNMAP and 6.5. I read your post about direct goes OS UNMAP and 6.0. Reading the post comments you said the only way you could get it to work automatically was to format NTFS using 64k clusters. Does 6.5 overcome the NTFS 64k requirements for it to happen automatically with server 2012 R2+? Since it is now an asynchronous process in 6.5. Regarding 6.0: when you format an NTFS volume with 64k clusters on server 2012 R2 and you delete items from the file system, when does the UNMAP against the storage array occur? The other part of this is in-guest UNMAP. This is when a file is deleted inside of a guest (inside of a virtual machine) from its filesystem, like NTFS or ext4 etc. When a file inside a guest is moved or deleted, if properly configured, the guest OS (Windows or Linux or whatever) can issue UNMAP to its filesystem. VMware will then shrink the virtual disk. If EnableBlockDelete is turned on, VMware will then translate the UNMAP to reclaim the space on the array itself. To enable this behavior automatically inside of a Windows VM, the NTFS must use the 64K allocation unit. If so, Windows can then issue UNMAP to a virtual disk and VMware will finish it at the array. Linux requires the discard option to be used to enable this behavior for its filesystems. This is different then VMFS unmap before as it starts at a higher level and it not deleting or moving a virtual disk–instead just shrinking it. Does that make sense? Hmm I haven’t tried it with the automatic mount option like this, I have only manually mounted them with the discard option. Let me look into this and get back to you. Does this work with the new Virtual NVMe controllers on Enterprise Linux 6.5 (RHEL/Centos)? Fstrim seems to give FITRIM ioctl failed, seems to work OK with the regular controller though. No UNMAP will not work with the vNVMe controller. You’ll need to stick with PVSCSI or LSI for that. Sure thing! It actually makes sense when you think about it. NVMe replaces SCSI, and UNMAP and TRIM are SCSI commands, so for them to be translated the driver and stack needs to support what is called Dataset Management Commands in NVMe, which it doesn’t yet. I imagine that support is coming. VMware is just getting started with their NVMe support. Thank you for explanation. It is very useful. My question is: Should the command “vsish” work for any volumes? Our datastore has two different disk groups with several volumes. Visish command for volumes on one diskgroup works well, but for volume on second disk group write: “VSISHCmdGetInt():Get failed: Failure”. Is it mean, that unmap doesn’t work on this volumes? I’m seeing different behaviour with regards to CBT. When I look at the drives on a CBT enabled guest the drives appear as standard “Hard disk drive”. I’ve updated the VM hardware and VMware tools, is there something else specific that I am missing? Interesting. Yeah try that and let me know. I will look into this as soon as I get a chance as well. What linux distro are you using for the above testing? Cool. My esx hosts running 6.5 and vCenter is 6.5. I’ve installed latest distros of ubuntu and centos and can only ever seem to acheive [SCSI-2]. I’m beginning to think it is not important, but the perfectionist in me wants to see SCSI 6 with SPC4. Are you using the latest version of vm hardware? vmware hardware version 11. Essentially the latest of everything that is production ready. correct. WIll try and get back to you. thanks. hw version 13 did the trick. Thanks. I have vsphere 6.5 running and it appears that the automated unmap was working. I migrated a VM from a datastore and the datastore is physically emtpy aside from vsphere folders/remnants. Vsphere claims 1.46gb of 3TB is used on the lun, which seems legit. The SAN thinks 263gb of 3TB is still allocated. This is down from 1TB to 263gb a few days ago (after I moved the VM). How can I get the SAN to match vsphere’s numbers? 1)If the datastore is physically empty (no running VMs) automatic UNMAP will not engage, so nothing will be reclaimed. 3)I believe there is also a bug where manual UNMAP will not reclaim blocks if they used to be allocated by thick type virtual disks. Only automatic UNMAP will get rid of that space. If there are no running VMs, that capacity is stranded. I think this is fixed in vSphere 6.7. I cannot confirm that though. 4)What array do you have? What vendor/model? 5)Regardless, you have two options. If the datastore is empty, you could just delete it and remove it on the array. Option two, depends on your array. If it has zero removal (like the FlashArray) you could just create a very large eagerzeroedthick virtual disk on the datastore. That will zero out the dead space and the array can remove it. But the ability for the array to do that depends on your array. @Cody, Thanks for the feedback. 1) I’m not certain this is necessarily the case. I vmotioned a VM from one datastore on an array to a completely different datastore on a different array. Once it was finished moving off, I was on the array’s management GUI and the next day or so, I could hit refresh and see blocks clearing out. I figured this was UNMAP working. Again, the array was empty at this point according to vsphere, but went from about 1T to 263gb. 3)This VM definitely had large/beefy disks that were thick provisioned. One disk was 2T. It might be a big, but there were definitely blocks UNMAP’d despite this idea. 5) Deleting this one would be fine, but I was more interested in how this all works for future causes. What if this happens again and I don’t have the ability to migrate the VMs off? The zero out, I’ll have to look into. I’m not sure I fully follow though, create the eagerzerodisk and then what do I do, to confirm it released the blocks. Sure thing! Essentially each host has an UNMAP crawler and it monitors only datastores that are “Active” for it, meaning they have a powered on VM. And every so often they kick into gear and run unmap. My guess is the host running that last VM was working on it and was able to reclaim some of the space even after it no longer had any VMs because it was still working. Though it is hard to say without looking at the UNMAP counters. Yeah the thick virtual disk issue and UNMAP hasn’t been an issue I have seen, but a friend at EMC told me about it and that VMware had confirmed some issue. I dont know the specifics. Maybe it just doesnt work 100% of the time with thick. So I believe Kaminario should be able to perform zero removal, so if you create a huge EZT disk and then delete it, the array should clean up the space. In theory. I dont know Kaminario at all, so I would ask them about how they handle contiguous zeroes. I went back to one of your posts from April 24 when you mentioned, “No UNMAP will not work with the vNVMe controller. You’ll need to stick with PVSCSI or LSI for that.” I verified that the SCSI controller is the VMware Paravirtual controller. The ESXi hosts are fully patched 6.5 (Build 8294253) and I’m connected via 10GB to a Pure //m20r2 running 4.10.5. Thanks for any helpful pointers. BTW, I forgot to mention that all file systems are VMFS 6. Hey! Hmm okay. My first question would be are you on the latest version of vm hardware? Yup, they’re all HW level 13. Sorry I forgot to mention that. Found the problem. I had patched the ESXi servers which required me to upgrade the VMware Tools. I had done that with the Powershell command with the noreboot option. Well, that was the problem. I needed to reboot the VM and now the fstrim works OK. Sorry for wasting your time. No worries! Glad to hear! We manage our over subscription of Storage at the Array level, and use EZT vDisks so that a datastore cannot be oversubscribed (We also do not permit VM snapshots but thats irrelevant to this conversation). We are vey excited to use in-guest UNMAP, but it states it requires us to use thin vDIsks. Is there a VM Deployment method in which the vDisks are thin, thus getting us support for in-GUEST UNMAP, but fully blocks off the provisioned space at the datastore level so that our Admins can not over subscribe the datastore? Or even if it shows free is there posssibly a setting we can enable to prevent over subscription of the datastore? I wish… Unfortunately thin will always be thin (especially with in-guest UNMAP). You could fully write it out, but as soon as you delete something in guest, the allocation would be reclaimed. This is something that would be possible with VVols, because we (Pure) control the datastore allocation reporting. How is unmapping affecting pure storage ? Is there a way to disable it on the pure storage side ? or only possible on vmware side ? I see unmapping happens every Sunday on my pure storage and I am trying to stop it on the vmware side but without any success . How the pure storage arrays deals with extensive unmapping activity ? Is there a particular reason you don’t want it? VMFS issues auto unmap by default to make sure dead capacity doesn’t persist. Disabling it will cause wasted space to build up in your array. Though this post shows how to disable it (change low to none). But I strongly discourage doing so. The unmap process is fairly unobtrusive and helpful.